It was a cold January day. My winter break had reached its end, and I needed something else to read. I’d been wanting to read on my mom’s Kindle for a while now. So, I picked it up and purchased two books. 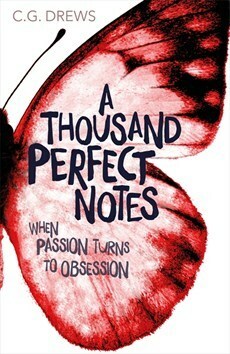 One, the one I’m reviewing today was A Thousand Perfect Notes by C.G. Drews. As I watched it, I realized something. I realized that I understood what was happening, but more importantly, what the characters were saying and what it meant. I was so excited. It may seem silly, to be excited at watching a show meant for kids years younger than I. But, it meant something. It was the end of July, a few days before my family was to leave for vacation. I was pondering what to post. My mind was drawing a blank. I felt this pressure to post certain things and make my blog a certain way. I stepped away from my computer, grabbed a piece of paper and wrote out my honest thoughts about blogging. I realized I didn’t love blogging. I had loved it when I started, but my love had fizzled out. At first, I was shocked. I knew I didn’t love it, but I didn’t want to stop. Bookworms disagree on all sorts of things, whether it be book ratings or bookmarks vs dog ears. But, there is one thing we all agree on. And that is the fact that being a bookworm comes with many struggles. I’m very excited to post this because this a collab with the amazing Olivia from Purely Olivia. She is fantastic, always writing great posts or leaving sweet comments. She usually posts about books, but she also does some lifestyle posts. When I asked her about collabing, she immediately agreed and put forth the idea that we write about bookworm struggles. It was perfect!We will each be sharing 5 struggles in order to show you ten that all bookworms have. I always thought that I didn’t need a niche. I was truly a niche naysayer, posting about anything and everything. But then, I realized that you guys really enjoyed when I posted about reading and writing. And I loved posting about those things too. Those two things were why I had created my blog in the first place. So, I wondered for a while why I got away from those topics. Maybe it was because I read blogs that focused on other things, like lifestyle. Maybe it was because there were other things that I was more into. But, either way, I had stopped posting about those things. In January, I decided to go full swing back into book blogging. That didn’t exactly happen though. My blog was as nicheless as ever. And I knew it was time to really think about it. I do not have any favorite authors. Yes, dear Winged Wonder, that is exactly what I’m telling you. I know, I know, it’s very strange. I’ve seen many a blogger rave about “this author this” and “that author that”. But the truth is that I can’t relate. December is almost over. The year is almost over. I don’t understand that at all. It’s pretty crazy that tonight, I will be staying up to shout “Happy 2018!” But, that’s later. Right now, I’m going to wrap up December, before I later today, wrap up the year.